The historic small coastal village of Glenelg in the North West Highlands of Scotland is found on the ancient route of the Skye cattle drovers and the nearest mainland point to the Isles by the Kylerhea straits. A few miles on towards the old herring village of Arnisdale you will come across Sandaig, Gavin Maxwell's Camusfearna from his famous novel 'Ring of Bright Water' and home today to the cairn of his beloved otter Edal. Looking up Glen Beag you'll come across the mysterious Pictish Brochs under the protection of Historic Scotland. Just outside the village there are the ruins of the Hanovarian Bernera Barracks, an 18th century garrison built for Government troops to provide defence against Highland supporters of Bonnie Prince Charlie. 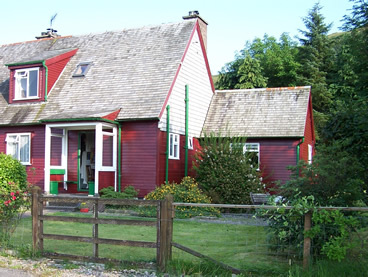 The Forestry House is a beautiful self-catering property on the outskirts of the village with a wild garden sweeping up to the hills beyond. It is non-smoking, and pets are welcome. 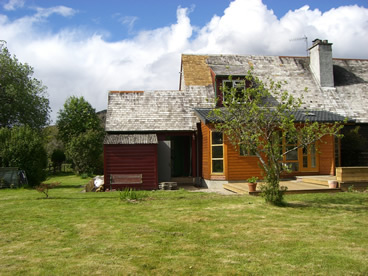 Forestry House: attached house, 2 double bedrooms and one twin.